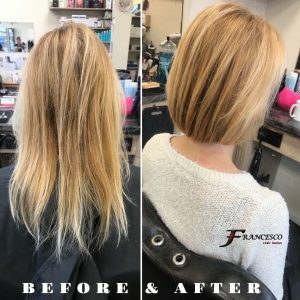 At Francesco Hair Salon our team of hairdressers and barbers offer a wide range of hair services for men, women & children…. We are probably best known for our exclusive barber service. Our team of highly experienced and qualified master barbers cater for the modern gentleman of all ages and have worked with and for some of the best known brands and barbers in the industry. You can experience the full barber shop experience as we specialise in both modern & traditional hair styling including beard trims, wet shaves, scissor cuts & specialist clipper work including flat tops. Our commitment to offering the best men’s barbering service possible means we are the first & at time of writing the only barber shop in Ipswich to have been Accredited by the British Barbers Association. 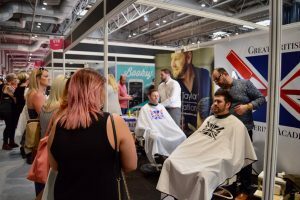 Our barbers are regularly asked to demonstrate on stage at some of the UK’s & Europes biggest trade shows and have worked on stage for highly respected brands such as The Great British Barbering Academy, Mike Taylor Education and Takara Belmont. We only use the finest male grooming products available including American Crew, Goldwell & Proraso. Our Mens Walk in service is available 6 days a week – no appointment needed. 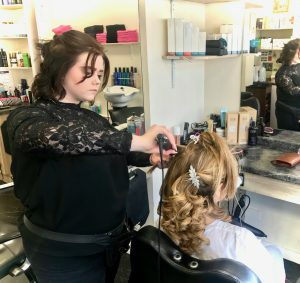 Our wonderful team of professional and highly experienced hair stylists are here to ensure you look and feel fabulous every time you visit our salon. Whether its a ‘quick trim’ or a full restyle & colour change you’re after we are here for you six days a week. Your stylist will interpret your needs to create a truly individual look. We work with several top brands including Affinage ASP, Goldwell, Philip Kingsley, ghd & morrocanoil. We offer complimentary tea & coffee whilst you’re at our salon and also have specialist treatments available for all hair types. Same day appointments are often available on weekdays. If its your first visit be sure to check out our online introductory offer. To book a ladies appointment or if you have any queries don’t hesitate to call us today on 01473 400034. Ranging from block colouring, highlighting, foils, balayage, ombre, creative colouring, root retouch, semi-permanent hair colouring, hair line and parting, colour correction & permanent waving. Please Note – You will require a skin allergy test prior to colour services. We offer a wide range of exclusive treatments for dry, dull or damaged hair. We have an extensive knowledge of the best treatments for your hair and scalp. Franco’s son Giovanni is Suffolk’s only qualified trichologist and we are able to consult with him to ensure your hair is receiving the best treatment possible. During your hair consultation we can determine which treatments are most suitable for you and design a personal haircare regime for your hair. Our treatments include the exclusive Philip Kingsley Hair Spa Treatment. We have worked with the extensive Affinage colour ranges and highlighting systems for almost twenty years and have an excellent knowledge of the range and more importantly the results speak for themselves! Getting Married? Then look no further for your wedding hairstylists for both bridal and groom. Our staff are highly experienced in both bridal party and groom party hair for your big day. Whether you would like a traditional, natural or contemporary look for your wedding day, we have a team of qualified stylists who can create the look you want in our salon or at a venue of your choice. Your trial runs will enable us to perfect your look to complement your whole bridal outfit before your special day arrives. We will work with you every step of the way because it is important that you find a bridal hairstyle that makes you look and feel great. To book your complementary initial wedding hair consultation with one of our wedding hair stylists please call us 01473 400034.